Welcome to The Community for Creative Non-Violence. The CCNV’s mission is to ensure that the rights of the homeless and poor are not infringed upon, and that every person has access to life’s basic essentials – food, shelter, clothing and medical care. The CCNV is also committed to protecting the rights of the homeless, advocating on behalf of the underserved and preparing homeless men and women to re-enter into mainstream society as skilled and productive citizens. We would like to thank you for supporting the efforts of the CCNV over this past year. Our ultimate goal is to end homelessness as we know it today. But this is still a distance vision and dream. As we enter this holiday season, we urge you to make a donation to The Community for Creative Non-Violence (CCNV). We rely 100% on donations from the public and some private grants. We do not receive any financial assistance from the United States government or the District of Columbia government for the operations of our charity. We are a 501(c)(3) charity and your donation is tax deductible. Your donation will help provide direct support for the homeless. Unlike other charities, The CCNV does not draw any salaries. Myself as the Executive Director, to all of our 40 plus staff members work for no salary. This makes your donation more effective – taking your donation straight to the bottom line and providing care where it is needed the most. I wish you a joyous holiday season and I wish you the best in 2017! The Community for Creative Non-Violence (CCNV) is proud to announce the partnership with Amazon.com, through its Amazonsmile program. Now, every time you make a purchase with Amazon.com, you can benefit The CCNV. Just simply visit the special site: http://smile.amazon.com/ and make the Community for Creative Non-Violence your beneficiary. Every time that you make a purchase through this site, you will benefit the CCNV. Our new website is designed and maintained by a 100% donation from EverZen Web Studio. 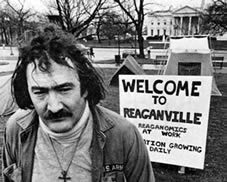 Mitch Snyder (1946 – 1990) was one of the early advocates for the rights of the homeless; he dedicated his life for this noble cause.